Secretary of Commerce Wilbur Ross gave the market a dose of reality today. He says the US and China are far from a trade deal, miles apart in fact, but that isn't really news. No one really thinks a deal is on the table yet but the hopes are high for some sort of progress next week. At the very least, an agreement to disagree that allows for future, earnest, talks to settle those disagreements. The ECB was also in the spotlight today. The European Central Bank left their rates unchanged but altered the statement and softened their tone. They still intend to begin hiking rates in the second half of 2019 but may not do it if the data and conditions warrant it. Mario Draghi says risks have shifted to the downside and ranked 'geopolitical factors' as the number one cause. This also isn't really news, just another confirmation that global economic activity has slowed and the trade war is the number one threat. Goldman Sachs CEO says (at Davos) there is little chance of a recession this year but the odds are about 50/50 for 2020. Morgan Stanley's CEO adds the government shutdown to the list of leading worries. He says there will be extremely negative consequences is the shutdown continues any longer. The shutdown took on a new twist yesterday with Trump and Pelosi squaring off for a showdown. She won't allow him to deliver the State of the Union Address but she can't stop him from going on TV so it seems like the balls in Trump's court. The Senate tried to vote on temporary measures to open the government but nothing came of the effort; stalemate persists. If only someone would come up with a plan to end it all. 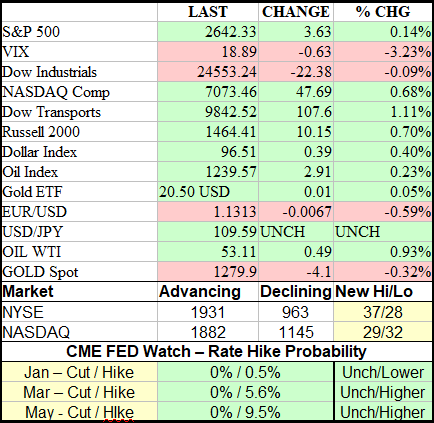 . .
With all that is going on, the market chose to take a breather today. The S&P 500 opened near to Wednesday's close and then traded in a tight range near that level the rest of the day. Volume was light but price action looks optimistic one or more positive catalysts will begin to get the rally moving again. Things that may move the market, other than trade and politics, is earnings. Earnings are coming in at a steady pace but the real peak of the season is next week when more than 20% of the S&P is expected to report. Also next week is the FOMC meeting. The committee is not expected to raise rates but may provide further guidance on the trajectory of interest rates over the next year. There is still a very low chance for either a hike or a cut in 2019. The labor does not show any negative effect from the shutdown or trade war. The initial claims fell to 199,000 this week, much lower than expected, and set a new low. This low dates to 1969 and is evidence of tightening within the labor market beyond what we've seen in the past. The four-week moving average of claims fell as well and is likely to track lower over the coming weeks. On a not-adjusted basis claims fell -22.2% versus an expected -17.1% but there is a catch. Not-adjusted claims are flat on a year over year basis and bear watching. Regardless, the data shows potentially strong hiring and certainly a high level of labor retention in January. The number of continuing claims fell -24,000 to 1.713 million. 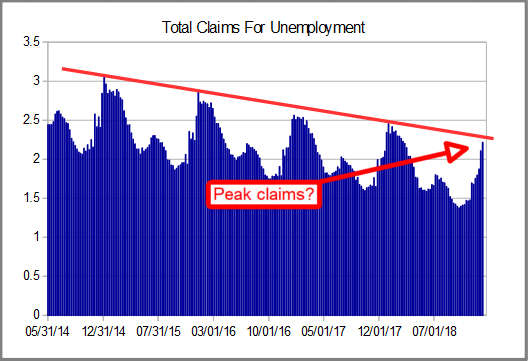 This is pretty high relative to the recent low but the figure is likely to come down in the next few weeks if the initial claims figure is a guide. 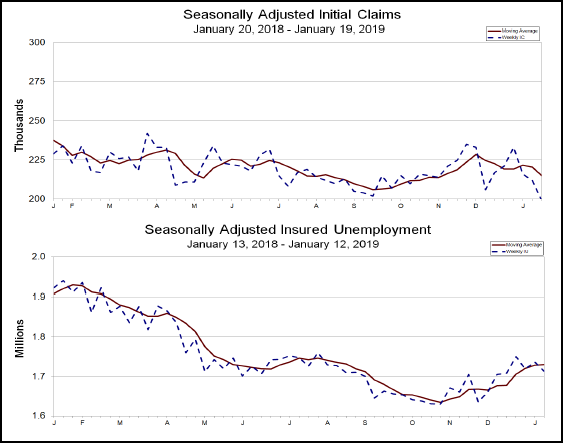 Regardless, the number of continuing claims is low relative to trend and consistent with labor market health. The total number of claims jumped 108,787 to hit 2.215. This figure is in line with seasonal expectations but below trend. Today's data point, for the week ending 1/5, is the peak of the cycle in the past data. If that trends hold true we can expect to see total claims fall off as soon as next week. Also, if this is the peak, we are well below trend and proof US labor markets saw considerable tightening over the last year. 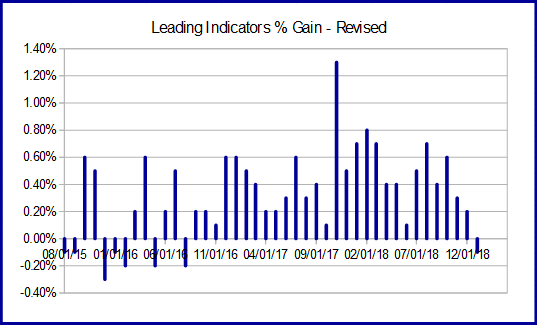 The Index of Leading Indicators fell -0.1% in the last month, the first contraction in 28 months and another sign activity slowed in the first month of the year. The Conference Board Analysts say the reading could indicate US GDP will slow to 2.0% by the end of the year, based on labor market trends I think it may not. The Coincident and Lagging Indices increases 0.2% and 0.5% respectively and show the US economy finished 2018 on a strong note. Markit's survey's of manufacturing and services sectors PMI were both good. The Manufacturing PMI rose 1.1 in the last month to 54.9, the Services fell -0.2 to 54.2, but both show solid activity continues within their respective sample group. 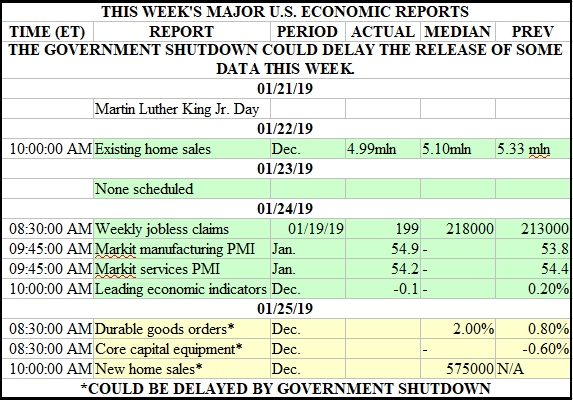 Durable Goods and New Homes Sales data is due out tomorrow but it won't come because of the shutdown. Next week's calendar is full too, including the PCE Price Index, and much of it will be delayed as well. In the economic vacuum will be an important FOMC meeting and a lot of earnings reports. The Dollar Index moved strongly higher on the ECB statement. Draghi's caution of downside risks and the possibility ECB rates could remain low into 2020 were the reason. 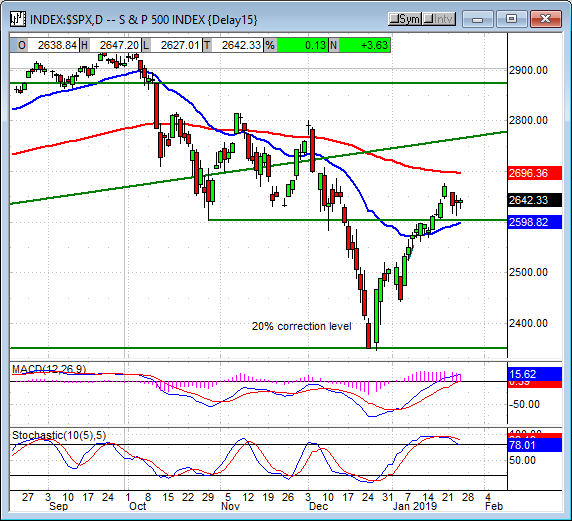 The index has confirmed upward drift within its trading range and now indicated to move higher. The next targets for resistance are at $97 and $97.50, either of which could cap gains. The next market-moving event will be the FOMC; if they sound dovish like they are expected to the dollar could easily linger within the range of $97.50 and $95.50 until the next round of central bank meetings. Gold prices fell on today's dollar strength but spot prices were able to hold above support. Support is at the short-term moving average and that level may hold in the near-term. There is a lot of risk in the market related to trade and that alone is enough to keep gold supported. A move below the EMA may be bearish but additional support targets exist just below it at the uptrend line where prices are likely to form a bottom. 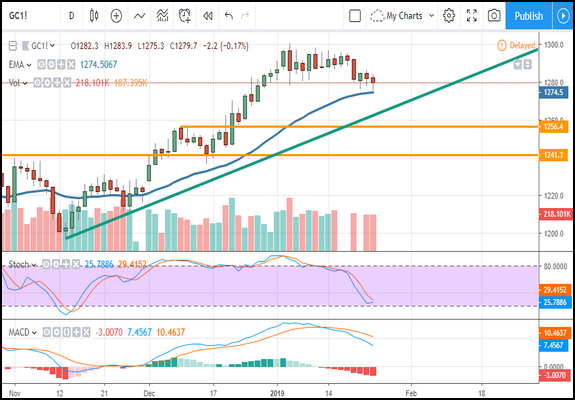 Looking out to next week the FOMC meeting could easily sap strength from the dollar and send gold moving back to the top of its range. 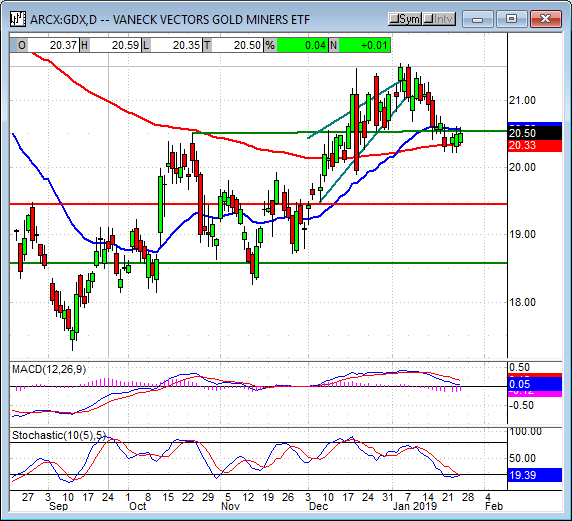 The GDX edged higher in today's session. The ETF continues to show support at the long-term EMA where a rally could be forming. The sector is supported by gold prices and aided by low oil prices so chances for solid earnings, or at least earnings outlook, is high. The indicators suggest a move higher is possible but there is still resistance to the move. Resistance is just above today's close, near the short-term moving average, and needs to be broken to trigger bullish trades. Oil prices continue to trend sideways within a narrow congestion band. Today's news includes US stockpiles and sanctions against Venezuela, either of which could have move prices if not for the other. On the stockpiles front, crude stockpiles increased by 8 million barrels, almost 9 million barrels above expectations, and were not significantly offset by gasoline or distillate production. In Venezuela, political chaos reigns supreme and Washington threatens sanctions against Maduro. The sanctions would impair the countries already deteriorating production, a problem that has been plaguing the market for some time, so not a real serious threat. Regardless, oil prices look like they will continue to move sideways until some other news emerges. The Oil Index moved sideways in today's session as it consolidates within a narrow range. The index may be gearing up for a major move lower considering that earnings outlook for this year is the worst of all eleven S&P sectors. Support is now at the short-term moving average, near 1,230, and it may hold but oil prices are the key. If oil prices fall, or even if they just remain weak, earnings outlook will suffer and that will drag the sector down. Results from SK Hynix had shares of chipmakers moving higher around the world. The Korean-based company says revenue is up 34% over last year and the outlook for the first half demand, revenue, and earnings is good. 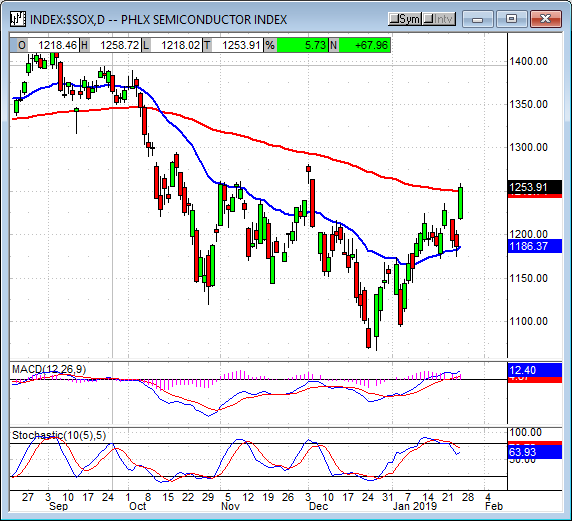 The Semiconductor Index jumped 5.5% on the news and created a large green candle. 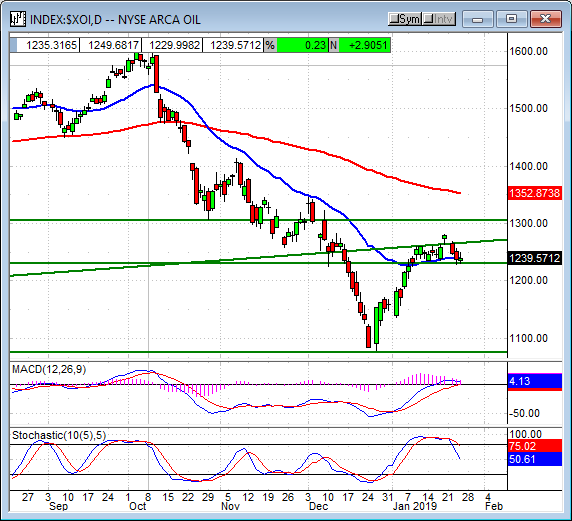 The index appears ready to move higher but there is some resistance at the 1,250 level that needs to be broken. Once that happens a move up to 1,300, 1,350, and 1,400 looks likely. Intel reported after the bell and did not quite fulfill the high hopes instilled by SK Hynix. The company beat on the bottom end but missed revenue estimates and gave light guidance that sent shares down nearly -8.0% in the after-market session. Weakness, weaker than expected growth, in Client Computing and Data Centers are to blame, along with the lack of key leadership. Intel is still searching for a new CEO and there are no candidates in sight. 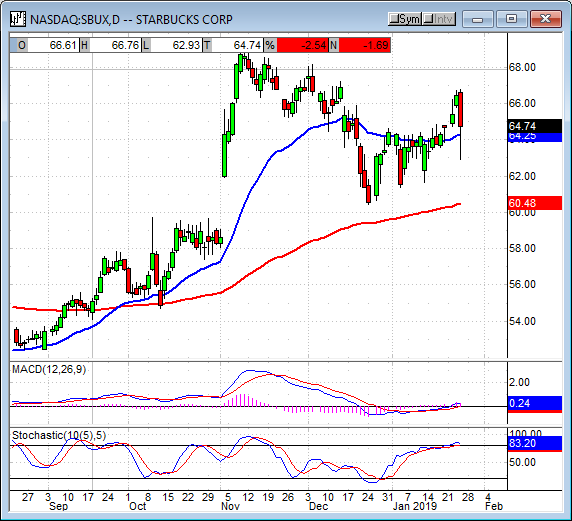 Starbucks reported after the bell and delivered a tasty treat to investors. The global coffee peddler says consolidated net revenue grew 9% over the last year and hit a record $6.6 billion. Sales were strong in all segments, global and US comps both came in at 4%, with China total store sales up 18% as the roll-out of Starbucks goes on undeterred by trade conflicts. The company also reiterated its previous guidance of 5% to 7% net growth for 2019; shares of the stock jumped 2.80% in after-hours trading. The indices didn't do much today, there is too much on the horizon to keep traders at bay. 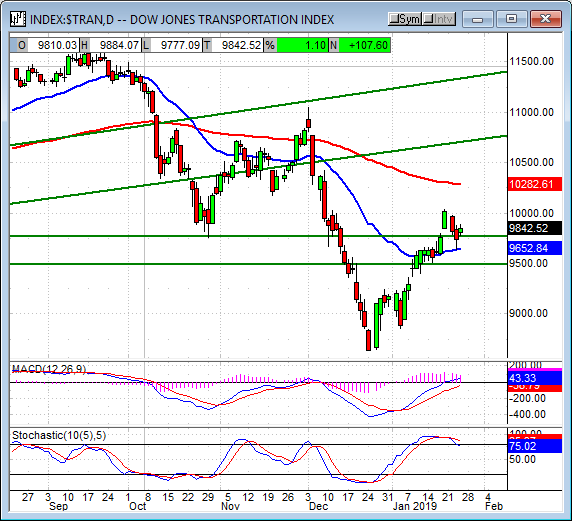 Today's action was led by the Dow Jones Transportation Average but even its 1.0% gains only produced a small spinning top candle. 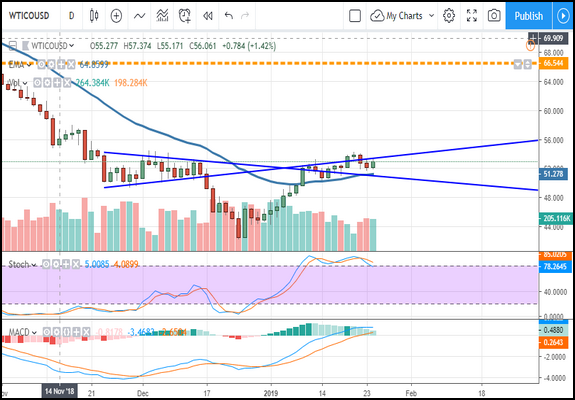 The index is still above support and looks like it could be setting up for another move higher but there are risks that I think will keep it moving sideways in the near-term. The indicators are consistent with consolidation at this level so a move sideways is not unexpected. Next week things may be different. A move higher would be bullish, a close above 10,000 is likely to test resistance at 10,280. A move lower may be bearish but there is lots of potential for support so that move would have to be decisive. The tech sector was the second strongest and helped the NASDAQ advance about 0.50% at the close. 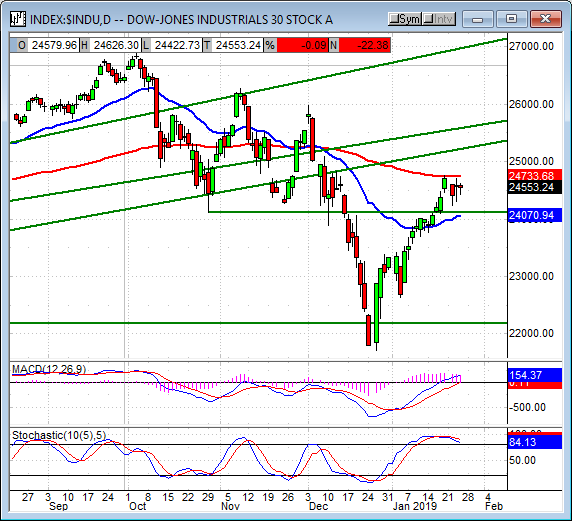 The index created a small doji candle sitting above a strong support level and looks like it could move higher. The support is consistent with the baseline of my Vee bottom reversal pattern and further supported by the short-term moving average. 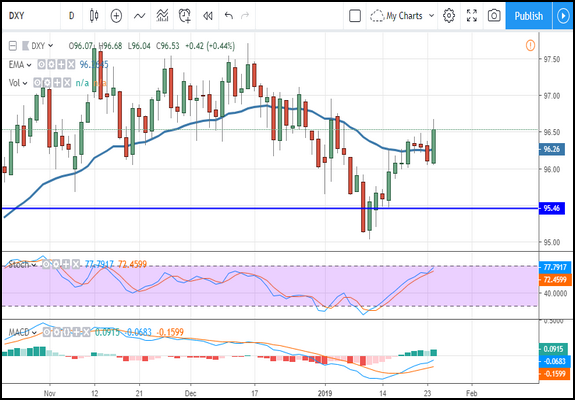 The MACD and stochastic suggest support may be tested again and it may be broken but I think it will take bad news of trade-level proportions for that to happen. A bounce from 7,000 would be bullish and could carry this index up to 7,250 or 7,500 in the near-term. The broad market was mostly flat in today's session, the S&P 500 closed with barely any movement after drifting around the 0.0% line all day. 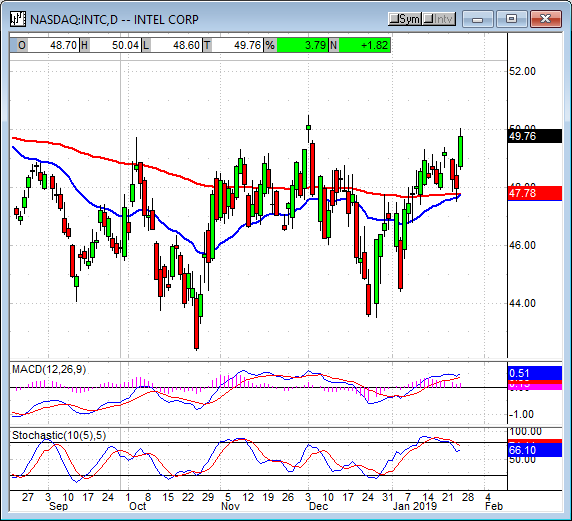 The index created a small spinning top doji that is part of a growing consolidation and above support targets. The indicators are consistent with consolidation and the possibility of price reversal but, for now, earnings and trade optimism are keeping prices well supported. A move up would be bullish and could take the index up to 2,700 or 2,775 in the near-term. The Dow Jones Industrial Average closed with a loss near -0.10% but it too looks like it could move higher in the near to short-term. The index is above support targets that confirm a Vee bottom reversal whose magnitude projects to new all-time highs for the blue-chips. I know that is a bold statement but the charts are the charts and the Vee bottom is more than 2,500 points in magnitude which puts the index above 27,000 when added to today's prices. 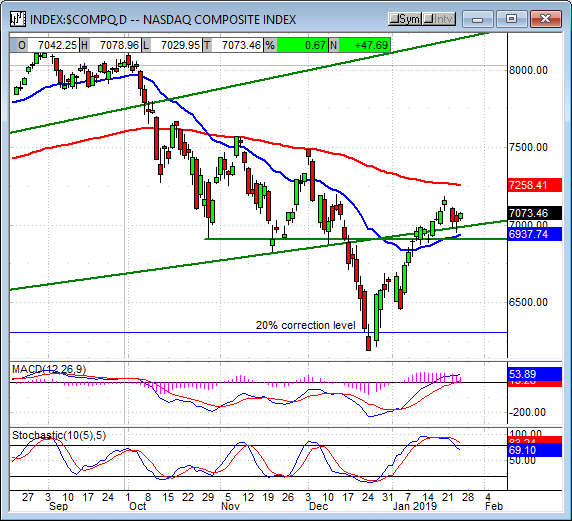 The indicators are still a little weak so consolidation may drag on for another few trading days. Next week with peak earnings, the FOMC and trade talks I think that will change. The indices, the market, the price-charts, look like they want to move higher. The signs are all there for a classic bullish advance all we need is a catalyst to drive it into gear. That catalyst may be trade and it may be the FOMC but one thing is certain, it will certainly include earnings. So far earnings have been OK, not great, but enough to keep the market hoping. Next week is peak earnings, if earnings stay good and the outlook is stable the rally could gain some momentum. I remain firmly bullish for the long-term, cautiously bullish for the near-term. Still no baby. Hopefully it comes before Monday.